Top-Up TV was always the poor relation to Sky or cable, but at £8 a month for a handful of extra channels on top of Freeview, it probably wasn't bad value. With the extra competition from BT Vision and Freeview Playback, it's now been reborn as Top-Up TV Anytime, which combines a Freeview PVR with a limited on-demand TV service. 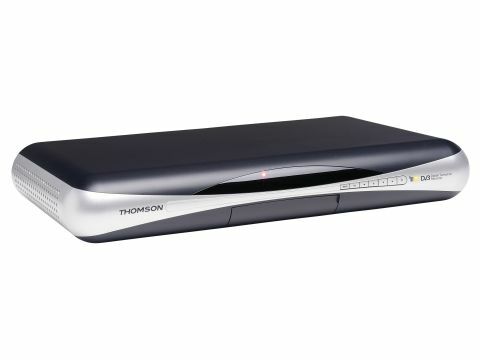 The TUTV Anytime box is built by Thomson, although at £140 it isn't great value for a twin-tuner 160GB PVR (about 120 hours by Top Up's reckoning). If you've already got Top-Up TV it's a very reasonable £75, or £120 if you buy it without a 12-month subscription. The remote control is a lot like the Sky Plus handset, and can also control your TV. Video outputs include RGB Scart and S-video, plus digital audio, although the latter won't supply Dolby Digital soundtracks - not least because there aren't any on Freeview or Top-Up. There's a USB socket under the front panel, although it's not active on at the moment. As a Freeview/Top-Up PVR, you're supplied with a 14-day programme guide, and you get series links like Sky Plus or Freeview Playback. You can also record two channels simultaneously The menu system is very easy to use, and you can create a favourites list of your most-watched channels. But Anytime isn't just a PVR, so the £10 monthly subscription lets you choose from 18 on-demand channels available in 'push' format. This means you select which channels you'd like to see, and up to 150 programmes are downloaded to the hard disk every week - if you choose fewer channels you'll have more space for your own recordings. You can choose from Paramount Comedy, British Eurosport, Hallmark, Living, Discovery Lifestyle, Discovery Factual, MTV, TCM, Animal Planet, Bloomberg, Life & Times, UKTV Gold, UKTV Food and UKTV Style, Boomerang, Cartoon Network, Cartoonitoo, Nickelodeon and Disney. An extra subscription of £5 a month will get you seven Universal studio movies a week from the Picture Box service. Despite the amount they're pushing down every week, the image quality of downloaded stuff is better than most Freeview broadcasts, although that may just reflect the low broadcast quality of most Freeview channels. However, this is one service that doesn't have any prospect of high-definition content. Those looking for an HD leg-up need to go elsewhere. Top-Up TV Anytime is just about worth the £10 monthly fee, and the box will work with Setanta's forthcoming Premiership pay-per-view football in 2008. The Picture Box movie service, however, isn't very good value compared to buying cheap DVDs in the high street. High definition rating: N/A. Video on demand rating: 2/5.